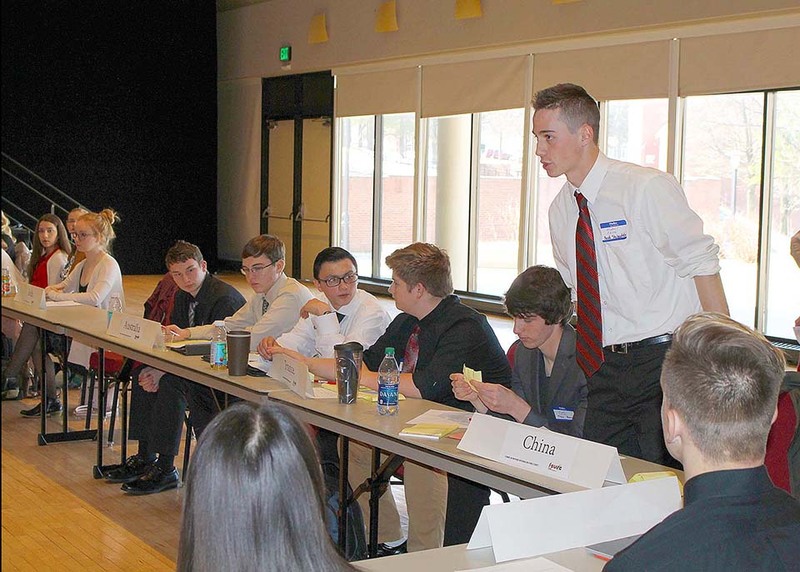 Frostburg State University hosted a Model United Nations activity on April 10, providing local high school students the opportunity to participate in a simulation of the United Nations Security Council. Students formed delegations representing countries from around the world and debated issues of war, peace and international relations. FSU’s Model United Nations is run by FSU students and faculty, with Dr. Stephen Twing from the Department of Political Science mediating the discussion. Model United Nations teaches researching skills, public speaking, debating and writing skills. Additionally, the event enables critical thinking and teamwork, as well as demonstrates leadership competency. FSU holds this event every spring for local high school students and will continue this educational exercise. Jakob Reed Stolzenfels, a senior at Northern Garrett High School, speaks as a representative of China in a discussion about the possession of nuclear weapons.